Are you ready for a frighteningly good time this Halloween? If yes, then Tabbuli is your answer! Fire Breathers, Drag Queens are just some of the entertainment awaiting you! We will also have themed drinks and special hookah just for the occasion. One of Charleston’s Best DJ’s , DJ Dynamik will be spinning the spooky tunes all night for you. 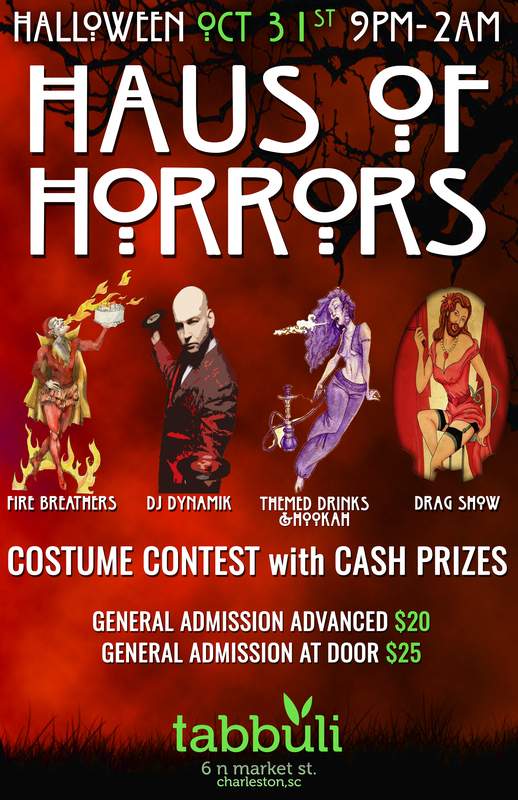 Come in your favorite costume and compete for prizes in our costume contest. Also, since we “fall back” this weekend, there will be an extra hour of partying! Make your Halloween a Tabbuli one this Saturday and come spook the night away with us! ← White Haute Nights – Vestique on King St.